South Korean violinist Ji in Yang began her music journey at the age of six. As a soloist, recitalist, and chamber musician, she has appeared internationally in such venues as London’s Cadogan Hall, Wigmore Hall, the Salle Gaveau in Paris, the Seoul Arts Center, Beijing’s National Centre for the Performing Arts, the Kennedy Center, Alice Tully Hall, Carnegie Zankel Hall and Weill Hall. Ms. Yang has appeared as a soloist with numerous orchestras such as KBS Symphony Orchestra, Aspen Young Artists Orchestra, New Amsterdam Symphony Orchestra, Auburn Symphony Orchestra, Sarah Lawrence Symphony Orchestra, Juilliard Pre-College Symphony Orchestra, Bucheon Philharmonic Orchestra, Suwon Philharmonic Orchestra to name a few, as well as numerous recitals. Ms. Yang tours regularly with the distinguished conductor-less Sejong Soloists and was appointed as its Samsung Foundation of Culture chair member, a distinction she held from 2006 to 2008. Their latest album on the Universal label “Passion” consists her solo performances of Piazzolla’s Four Season’s Summer, and a short piece by Ponce/Heifetz Estrellita. Ms. Yang’s performances have also been heard on radio and television shows such as NPR’s From the Top, a guest appearance on Korea’s National Television Show “Art Theatre” as well as on KBS arts program show “Classic Odyssey”, Japan’s NHK, and America’s Capital Public Radio show “Insight”. She has also performed at the United Nations celebrating Earth Day. Ms. Yang has collaborated with distinguished artists such as Joseph Kalichstein, and Cho-Liang Jimmy Lin, and has performed at festivals such as Aspen Music Festival, Great Mountain Music Festival, Festival Music Alp, Sarasota Music Festival, Tongyeong International Music Festival, International Heyri Art Festival, and at SFX International Sound Art Festival. Ms. Yang has received Bachelor and Master’s degree in Music from the Juilliard School where she has studied with Hyo Kang and Dorothy DeLay, and Artist Diploma at Yale University under Hyo Kang. 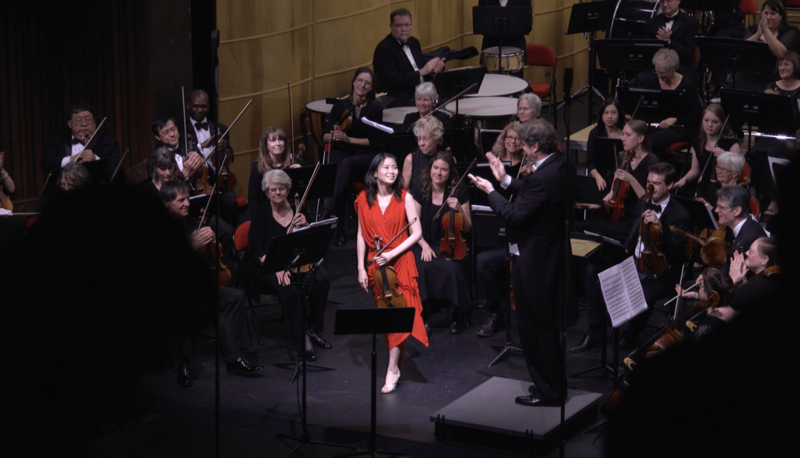 Ji in Yang with the Auburn Symphony in 2016. Ms. Yang is currently pursuing her Doctorate of Musical Arts at the Graduate Center of the City University of New York as a full scholarship student under Daniel Phillips. Ms. Yang has also played in master classes of Ruggiero Ricci, Itzahk Perlman, Rodney Friend, Robert McDuffie, Dong-Suk Kang, and Igor Ozim. Ms. Yang plays a Petrus Guarnerius violin, made in Venice in 1723.